The songwriter performs with his Free Nationals band. Anderson .Paak and his band The Free Nationals came through NPR's Tiny Desk Concert series to perform some of their soulful R&B and hip-hop. 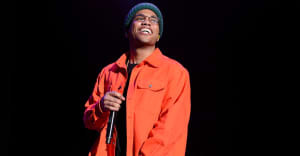 .Paak settled into a drum set with the band nestled around him in the cozy settings for a much fuller sound than the series usually gets. Watch the performance above and check the setlist below.